Once the inventory management add-on is activated, you can enable inventory management for all products in your catalog. To do this, open a product and then click Enable stock from the product record. A window will open which will allow you to define multiple elements needed for inventory management. You have to input your initial stock, the minimum stock at all which you would like to be alerted when stock runs low, and your original purchase price stock. Then you must choose the calculation method to valuate the stock. The default is weighted average unit cost. If you want to Manually manages your costs, choose none. Then select the warehouse stock for That initial input. Click Save, and inventory management is enabled. Detailed information about the status of your stock can be seen by clicking close Stock status. 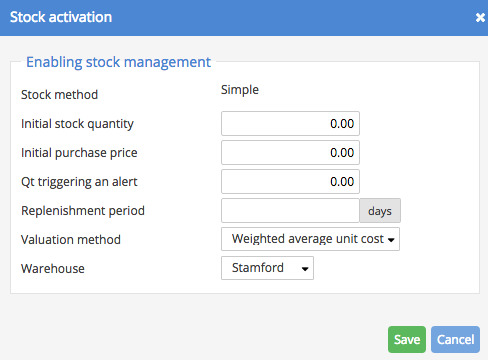 Finally, you can always choose to do a manual movement of stock (in the case of inventory lost/broken products, etc. ).